I landed in frigid, snowy Utah and, almost immediately, I was overtaken by the Sundance High-that sunshiny adrenaline rush that gives you the illusion that everything and everyone are wonderful beyond words, and conversations hit that giddy intensity usually reserved for the first day back at college or summer camp. And, as always at Sundance, documentaries abounded, in and out of competition, from the US and from around the world. The Black List, directed by photographer/portraitist Timothy Greenfield-Sanders and produced and written by film critic Elvis Mitchell, takes a pulse of the African-American zeitgeist of the 21st century, through the perspectives of 22 high-profile blacks representing a range of professions. Mitchell, as interviewer, manages to coax out a rich succession of eloquent, profound, hilarious and deeply personal observations from the likes of Colin Powell, Toni Morrison, Kareem Abdul-Jabbar, Suzan-Lori Parks, Chris Rock and a host of others. Combined with Green-Sanders' stately framing and lighting, The Black List answers the question "If these portraits could talk..."
Katrina Browne's Traces of the Trade, which I saw after The Black List, could be seen as a sort of dyptychal answer to that film. Browne, a descendent of the DeWolfe slave-trading family, put out a call to other family members to go on a journey with her to trace the trade route back to Africa from Rhode Island. The journey is painful and painfully honest, and reaches emotional crescendi in Ghana and Cuba as the collective soul-searching becomes one of not only history and responsibility but also of personal guilt. The family members who took the journey resolve to continue it, to go beyond the hard questions of white guilt and white responsibility and spread the dialogue about reparations and reconciliation. Ellen Kuras' long-in-the-making Nerakhoon (Betrayal) is a journey of a different sort--for Kuras, a 20-year labor of love, and for co-director, editor, writer and subject, Thavisouk Phrasavath, a bittersweet testimony to the immigrant experience. Phrasavath had escaped from war-torn Laos, following the US bombing in 1973 and the subsequent takeover by the Communist government. He reunites with his mother and two sisters--his father had been arrested by the Laotian government, and his other two sisters had stayed behind--and begins his difficult struggle to gain a foothold in the US, in the gang-ridden streets of Brooklyn. Nerakhoon traces his arc of survival, uneasy adaptation and assimilation and re-emergence as an artist with the tools and sensibility to express his two-decade odyssey. The Linguists, from directors Seth Kramer, Daniel Miller and Jeremy Newberger, follows two young American academics, David Harrison and Gregory Anderson, to remote places around the world on a mission to save languages from dying out. Both the film and the linguists were funded, in part, by grants from the National Science Foundation. Harrison and Anderson push the concept of language as a science, encompassing mathematics and systems of time, as well as grammatical structure. I had heretofore engaged language as an art, and the fundamental building block of expression, but this film opened my mind to a new direction. 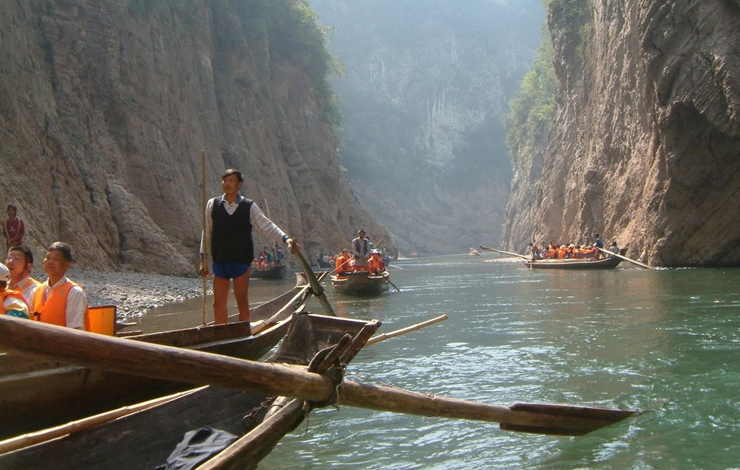 Prior to a screening, Director Yung Chang described his film Up the Yangtze as "The Love Boat meets Apocalypse Now," as he uses a tourist cruise ship up China's Yangtze River as the narrative spine for a deeper inquiry into the impact of the Three Gorges Dam on the lives of millions of residents along the river. Chang follows two of those residents as they take jobs on the ship to support their families, one of which will be displaced because of the dam. By cutting back and forth between the faux world of the cruise ship and the starkly real world of the families who are struggling to survive, Chang shows a China in jarring transition, from a 1,000-year culture to a modern global economic power, and the tremendous sacrifices made in the name of progress. There wouldn't be a festival without docs about the Iraq War. Recycle, from Jordanian filmmaker Mahmoud al Massad, profiles the daily life of a resident of the hometown of Abu Musa al Zarqawi, the late, self-styled head of Al Qaeda in Iraq. Like such antecedents as Iraq in Fragments, My Country, My Country and When Adnan Comes Home, Recycle succeeds as an intimate, ground-level story of life during wartime. The film's title comes from both the protagonist's day job picking up discarded boxes for recycling and the endless cycle of circumstances--poverty, disenfranchisement and the ongoing struggle between Islamic extremists and moderate followers-that help inform the onset of terrorism. The protagonist takes us through the streets of Zarqa, accompanied by his young sons, and to the apartments of friends, where debates abound about politics and Islam and the tricky negotiations between faith and fundamentalism. Recycle earned for al Massad the World Cinema Cinematography Award: Documentary. With CSNY Déjà Vu, the latest from Bernard Shakey (the filmmaking moniker for Neil Young), I had expected a simple concert film featuring four aging hippy rockers on a nostalgia tour. But I was pleasantly surprised. Young gathered his old bandmates, David Crosby, Stephen Stills and Graham Nash, for a cross-country musical protest against the War in Iraq--just as the quartet had actively taken on the Nixon administration and the Vietnam War over three decades earlier. Young engaged journalist Mike Cerre, who had covered both the Vietnam and Iraq Wars, as an in-house reporter of sorts, embedding himself on the Freedom of Speech Tour and interviewing the band, as well as audience members, anti-war activists and a smattering of pro-Bush conservatives. The resulting film is both an inside look at the artistic process of producing a thematic tour like this one, and an even-handed, warts-and-all reaction to the artists, from critics and audiences members alike. Although James Marsh's Man on Wire is not even remotely about the War in Iraq, the World Trade Center, the destruction of which launched this troublesome decade, figures as a more benign character here; the film documents high-wire artist Philippe Petit's daring 1974 walk between the Twin Towers. Through re-enactments and riveting recollections from Petit as well as his cohorts in crime, Man on Wire captures the passion and verve of an artist and the magic and wonder of his stunning feat. Wisely opting to focus on the event itself and the years-long planning process leading up to it, Marsh has created a tightly structured and wildly entertaining work. Petit himself, 37 years after his triumph, is an charmingly impish raconteur. For 45 minutes, he walked on clouds, creating an indelible work of art, one that would define the World Trade Center until September 11, 2001. The only reference in the film to that horrible day is a still photo of Petit walking zenlike between the Towers and a plane, just overhead, seemingly heading straight for them. "The film tries to get you beyond 9/11," Marsh explained after the screening. "It's a fairy tale." Man on Wire captured the Audience Award and the Grand Jury Prize in the World Cinema Competition: Documentary. Among the documentary-related panels at Sundance, "The Double Bottom Line" stood out; panelists included John Schreiber from Participant Productions, Bristol Baughan from GOOD/Reason Pictures, The Devil Comes on Horseback director Annie Sundberg and Jess Search from Channel 4 Foundation, who moderated. The double bottom line implies the tricky proposition of making money for your documentary, while making money for­--or bringing a critical mass of attention to--the cause that your documentary addresses; An Inconvenient Truth is a rare example of that. Search talked about how the traditional model of public support for documentaries in Britain is now broken. There's also the challenge of partnering with a Non-Govermental Organization, and the attendant question of whether it wants to spend resources to support a documentary, instead of channeling those resources into its own activities. Ditto for those foundations that need to make that determination about whether money is better spent on a film than on a cause. Sundberg pointed out that even though The Devil Comes on Horseback fell short of expectations at the commercial box office, it has done well in non-theatrical screenings; she emphasized holding onto educational rights. The double bottom line is clearly a malleable issue, as many models were discussed at the panel. Search emphasized that docmakers needed to come up with business plans and think of new ways to measure success: What are the matrices? What is the social return on investment? What are the cross-branding opportunities? Clearly, this is a wide-open field, with no definitive formula for success. This sort of vital food for thought typifies the Sundance experience, along with delightful cinematic discoveries, reunions with friends and colleagues, newly formed friendships and partnerships, and freshly gleaned ideas. And, of course, the requisite post-Sundance flu, which would carry me into the next month. Thomas White is editor of Documentary magazine and content editor of www.documentary.org.